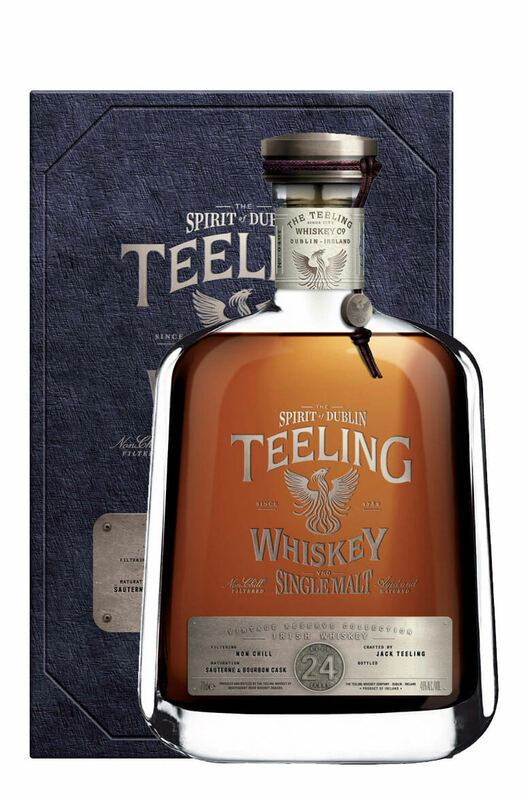 2017 Release- The Teeling 24 Year Old Single Malt Irish Whiskey was first distilled in 1991 and matured in Bourbon casks then allowed marry in Sauternes wine casks producing a wholly unique taste experience. The unique dual maturation imparts an extra depth of fruit flavours that perfectly complement the hint of smoke derived from the inclusion of a small portion of Peated malt as part of the original ingredients used in production. This small batch bottling, limited to just 5,000 70cl bottles, were hand bottled in unique decanter bottles and come with their own certificate of authenticity. Recently awarded the title of World’s Best Irish Single Malt, this is a whiskey to be savoured. There has been a few queries about whether it was the 2016 or 2017 release of Teeling 24 Year-Old that recently won the world’s Best Single Malt at the World Whisky Awards. Both releases are from exactly the same vatting with the whiskey being distilled in 1991 and matured in Bourbon casks before being further matured in Sauterne sweet wine barrels. These casks were then vatted together and split into two batches, half for the 2016 release and half for the 2017 release. The whiskey entered into the awards came from this vatting and was from the tasting stock rather than being from a particular release. This explains why all the whiskey is bottled as 24 year-old despite the 2017 release being bottled a year later. 2016 release was the stock image used when the award was first announced but I can assure you that both releases are the same fantastic whiskey. Nose A nice mix of lemon, boiled sweets, linseed oil, waxed jackets, marshmallow, orange peel and pineapple. Palate Smooth and a little sweet with a slight green, herbaceous and bittersweet flavour. Flavours of lime, lemon, apricots and some gentle spiced notes. The finish reveals waxy characters and hints of linseed and bees wax. Colour Very pale lemon yellow. Types of Barrel used for Aging Originally aged in ex-Bourbon barrels before being finished in sweet Sauternes wine barrels. The second limited edition bottling in The Revival Commemorative Series, Volume II, consists of a 13.. Currently the oldest Irish single malt whiskey available, and limited to very small numbers. This wa..